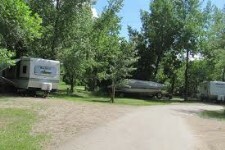 Good Spirit Provincial Park is a popular camp grounds that offers many great facilities for campers and visitors! 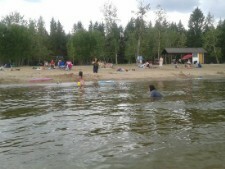 The shallow waters and sandy, weed-free bottom of Good Spirit Lake, the central feature of this provincial park located half an hour northwest of Yorkton off Highway #229, make it a popular destination for young families. The main beach area features a creative playground and manicured lawn, a picnic area with barbecues, and a change room with showers. Hit the beach and Squish the sand between your toes as you and the kids stroll out far from shore at the main beach. Or, grab your hats and amble down the shoreline trail to the sand dunes, where wind, weather and time have created an intriguing backdrop to a beach peach perfect for private sunbathing. There is an 18-hole mini-golf facility, a summertime food concession, tennis courts and superb beach volleyball courts that have hosted the provincial playoffs. Rental accommodations, an 18-hole, grass-green golf course with restaurant, as well as groceries, gas and liquor are all located less than 2 km from the park boundary. The Trans Canada Trail and a self-interpretive sand dunes trail are two of many park paths offering hikers and cyclists - and cross-country skiers, in wintertime - an opportunity to exercise and explore. Watch for fox, coyote, deer and rabbit in the dunes area, and moose and elk elsewhere. Grosbeaks, waxwings, sharp-tailed grouse and numerous water birds are common sights in the park, as well. Experience what Maclean's Magazine says is one of the Top 10 beaches in Canada. Wake up your senses at Good Spirit Lake Provincial Park. 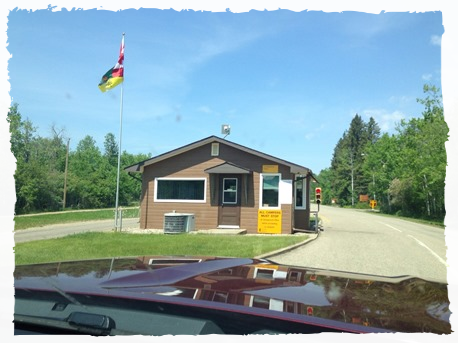 For the Campers - To ensure a fair opportunity for more visitors to enjoy a provincial park camping experience, some campsites have been designated as 'Maximum 14-Consecutive Night Stay' campsites from June 24 to the September long weekend. Back-to-back bookings by members of the same household in the same maximum stay campsite are not permitted; you are welcome to extend your stay in a different campsite at the end of 14 nights. 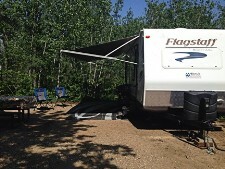 There are also unlimited stay campsites available on the reservation system for extended stays. Helpful Hint: When using either version of the online reservation system and you are staying less than 14 nights, 'include' maximum stay campsites in your search preferences. If you are planning a camping stay for more than 14 nights, 'exclude' maximum stay campsites from your search preferences.